Open since December 2001, the Cholla course at We-Ko-Pa has garnered countless honors and has quickly become recognized as the reference course for quintessential desert golf. Designed by Scott Miller, this 7,225 yard layout was named by Sports Illustrated as one of the 10 Best New Public Courses in the World shortly after its debut. Since then, Zagat Survey 2006-2007gives Cholla its highest rating among all Arizona courses and Golfweek ranks the layout # 4 on its 2013 list of Arizona’s Best Public Courses. The facility is complimented by a 21,000 square foot clubhouse that features a golf shop named four consecutive years as one of the “Top 100 Best Golf Shops” by Golfworld Business magazine as well as a full service restaurant serving breakfast and lunch indoors or on the spacious patio with breathtaking views of the surrounding mountains. 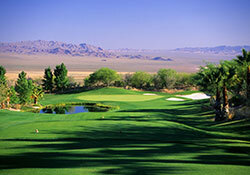 Additionally, Golfweek ranked Cholla the #45Best Resort Course in the U.S. When it comes to golfing in Las Vegas, no company has more experience, relationships and pricing discounts as Sterling Golf Services. Whether you're a small group or large corporate event looking to golf single or multiple days, we'll get you the best deals with the best service! © Copyright 2016 Sterling Golf Services. All Rights Reserved.